The Western European market of Technical Consumer Goods closed the first quarter of the year with positive results. According with GfK Temax, one of the main driver has been the request of premium and advanced products. 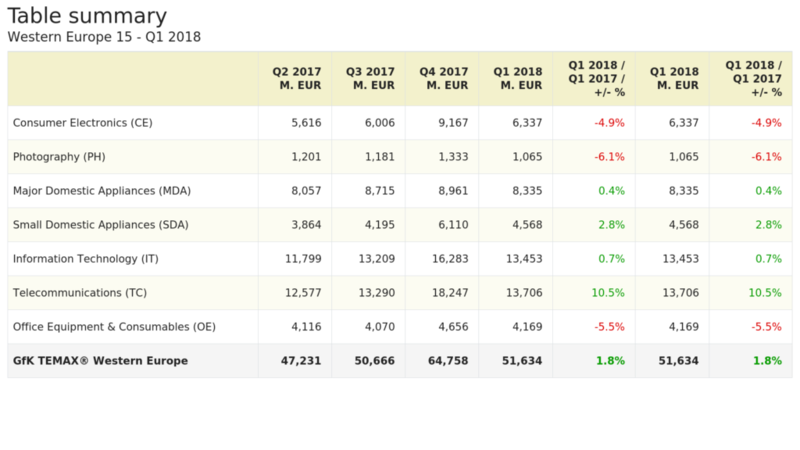 Major domestic appliances reached a turnover of 8.3 billion euro, with an increase of 0.4% compared with the same period of 2017, while small appliances recorded a stronger increase of 2.8%. A negative trend, instead, is that of consumer electronics, that saw a decrease of almost 5%. The whole area of Technical Consumer Goods closed the first quarter 2018 with a growth of 1.8%. As underlined in GfK experts comments, it is visible a stronger demand for premium appliances. “Consumers’ preference for owning fewer but higher quality items and this trend involves the most of technical consumer categories. Regarding White Goods, GfK specifies that “multifunctional appliances with premium price (for example washdryer, hobs with integrated hoods or combi-steam ovens) are strong in demand and spark value growth. Also lifestyle plays a role, especially for small domestic appliances, when consumers are willing to spend more than 300 euros for a rechargeable handstick vacuum cleaner or a robot”. Although the negative trend of consumer electronics, for TVs too, premium features such as 50+inch sizes and OLED turn a negative volume market into a value growth market. Further prominent examples are audio devices equipped with Dolby Atmos or DTS-X sound technology as well as high performance headphones and headsets above 150 euro selling price.